“Happy Winter Solstice”! That means the shortest day of the year arrives this month and after that, lengthening days. Unfortunately, there remain many cold days and even colder nights requiring vigilance for those of us that grow tropical orchids. This is also a time when having flowering orchids inside the house is really nice, not just for fragrance, but a reminder that good times will return and we can enjoy spring flowers and warmer days. There are a few aspects to bringing orchids inside that require your attention. First remember that home heating takes moisture out of the air. The same thing that dries your skin in winter dries out your orchid flowers and the plant itself. If you can set the pot containing your orchid inside a larger clay pot that sits in shallow water you will help your orchid flowers to last longer. A porous clay pot will wick water up and around the orchid plant limiting water loss. The ideal is for the clay pot to be large enough that there is space between pots. Misting occasionally will also help, but be sure you are not using water that goes through a softener. One last suggestion is that you sterilize any pot you are using to hold your blooming plant while inside. More and more orchids sold in the pot plant market are reportedly virused. While these flowers may look fine, viruses may be transferred to the next orchid that occupies the pot and lead to deformed flowers and the ultimate death of the orchid. Most of us don’t test our plants for viruses, so it is best to just sterilize pot surfaces with a 10% chlorox solution. Cymbidium growers need to pay careful attention to outside temperatures now in case there is a hard freeze. The cold should have initiated bloom spikes by now. If that has not happened yet you may need a few more weeks of cool nights. A light frost will not hurt the plant, but a solid freeze will likely damage your cymbidium. Once spikes begin to form, cymbidiums should be kept from temperatures lower than 45 F. In the South, they may be moved into a garage on very cold nights and in colder climates maintained in the cool part of the greenhouse until buds open. There are many types of dendrobiums that also need a cool, dry period to initiate buds. Some of these maintain their leaves such as Dendrobium aggregatum, while others, such as the nobile-types, drop leaves in response to the cold dry period. If you purchased the plant in flower and it has never bloomed again it may need this type of treatment. 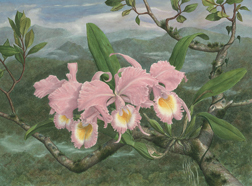 Unfortunately, the Dendrobium family is so large and found over such a wide range of environments that no single recommendation can be made. If you check the parentage of your dendrobium you can figure out its required growing conditions. The flowering process for phalaenopsis should also be well along by now, with spikes emerging and perhaps even buds developing on larger plants. Once buds form, it is necessary to maintain temperatures above 60 F to prevent bud drop and to limit various diseases that ruin flowers. You will also need to watch new leaves for rots that flourish in a closed growing space.